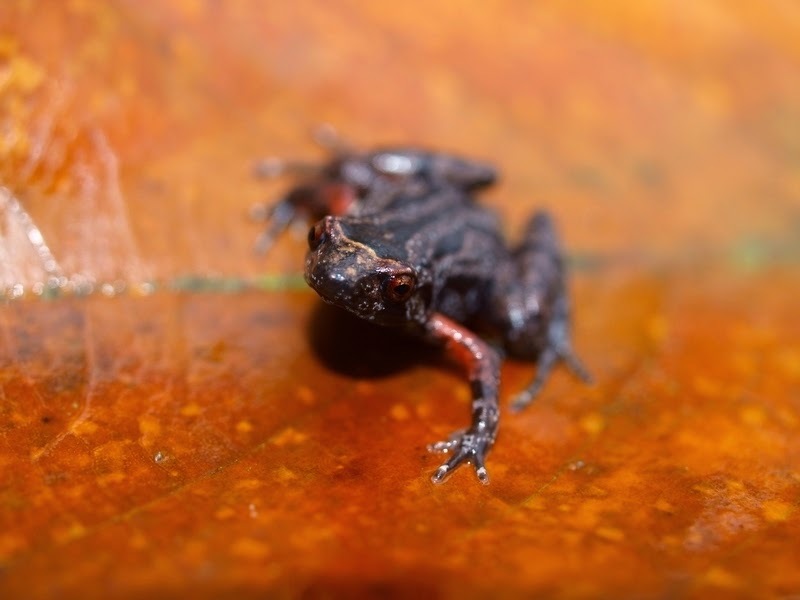 A new species of Narrow-mouthed frog of the genus Kaloula is described from northern Peninsular Malaysia. Kaloula latidisca sp. 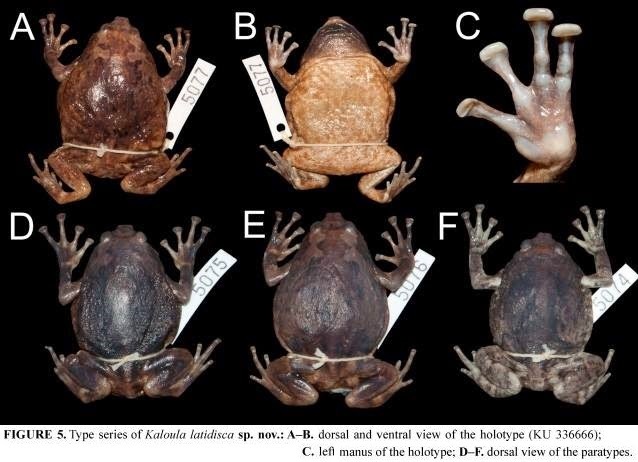 nov. is genetically and morphologically most similar to K. baleata and K. indochinensis but differs from those and other congeners by the unique combination of the following characters: (1) adult males SVL 49.2–56.2 mm (x̅=53.5 ± 3.0; N=4); (2) finger tips expanded into large, transversely expanded discs (disc width 2.8–3.1 mm, x̅=3.0 ± 0.1); (3) inner metatarsal tubercle large, oval, distinctly raised, slightly shorter than first toe; (4) three subarticular tubercles on fourth toe; (5) toe webbing formula: I 1–2 II 1–3 III 2–3.5 IV 4–2 V; and (6) yellow to orange irregularly shaped patch on the axillary, inguinal and posterior region of thigh. Chan, Kin O., L. L. Grismer & Rafe M. Brown. 2014. 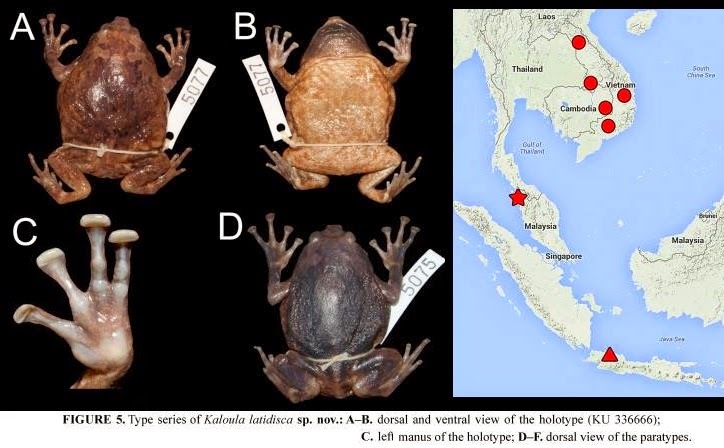 Reappraisal of the Javanese Bullfrog complex, Kaloula baleata (Müller, 1836) (Amphibia: Anura: Microhylidae), reveals A New Species from Peninsular Malaysia. 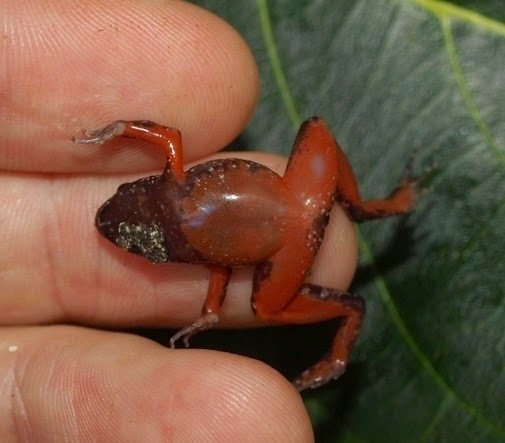 We describe a new red-bellied species of the microhylid frog genus Stumpffia from the Andasibe region (18°56' S, 48°25' E, ca. 900 m elevation) in central-eastern Madagascar. Stumpffia kibomena sp. nov. differs from all other described Stumpffia species in coloration, morphology, and by genetic differentiation in the mitochondrial 16S rRNA gene (≥8.6% uncorrected p-distance to all other nominal species of the genus). It is furthermore distinguished from most other Stumpffia species by its advertisement calls. 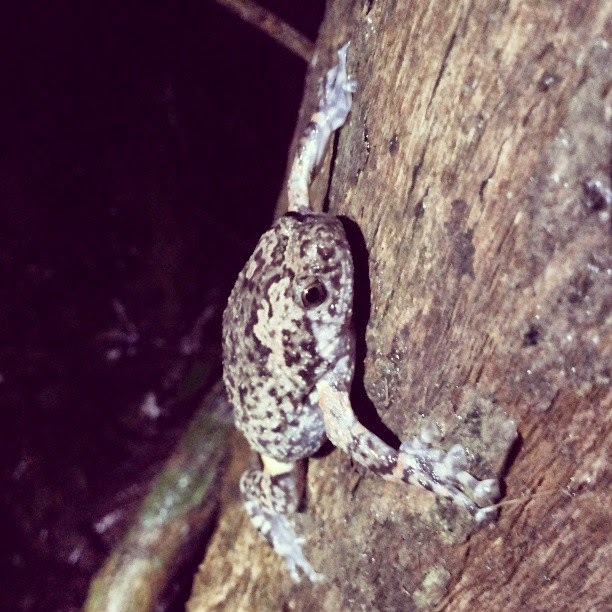 The new species is reliably known only from a few specimens collected in the Andasibe region and based on the limited knowledge we suggest its IUCN Red List classification as "Data Deficient". 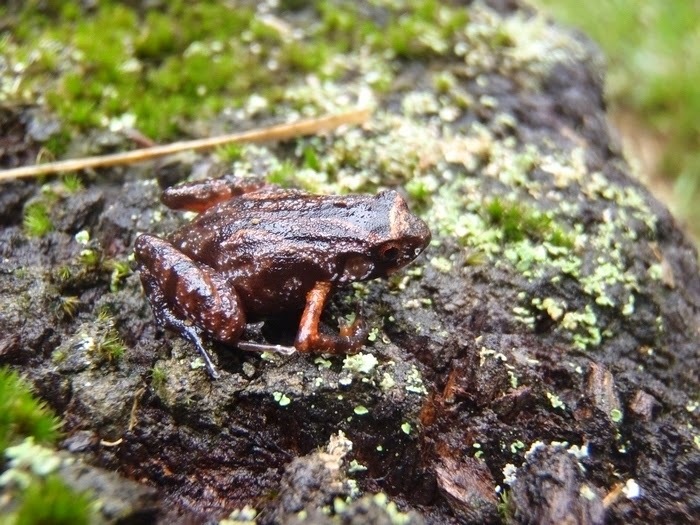 Keywords: Amphibia, Anura, Cophylinae, Madagascar, Microhylidae, Stumpffia kibomena sp. nov. In taxonomic accounts, three species of Myotis have been traditionally reported to occur on the island of Taiwan: Watase’s bat (M. formosus watasei Kishida), the Formosan broad-muzzled bat (M. muricola latirostris Kishida) and the Formosan mouse-eared bat (M. adversus taiwanensis Linde). The discovery in 1997 of an unknown taxon not fitting to the description of any of these species encouraged us to re-examine more thoroughly the systematics and phylogeny of Myotis bats inhabiting Taiwan. We used a combination of morphologic and molecular methods to aid the identification of the different taxa from this island and reconstruct their phylogenetic relationships. Multivariate analyses based on 17 craniodental characters of 105 specimens caught across Taiwan and further external characters allowed us to discriminate eight taxa of Myotinae co-occurring on this island. 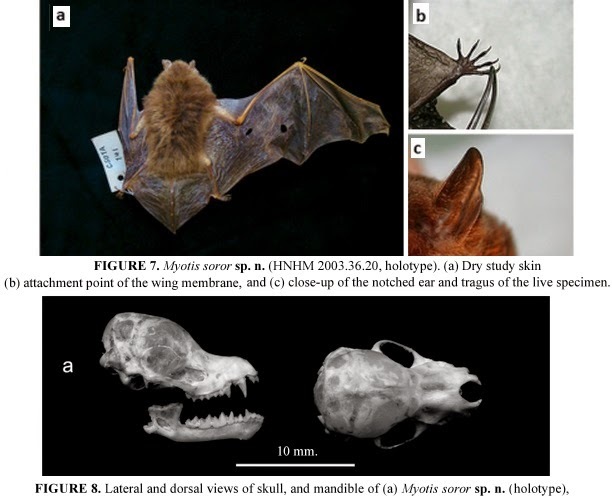 A subset of 80 specimens were further sequenced for the cytochrome b gene (1140 bp) and subjected to phylogenetic reconstructions including representative species from adjacent China and from all main lineages of the worldwide Myotis radiation. These molecular reconstructions showed that the Myotinae from Taiwan are phylogenetically diverse and are issued from several independent clades. The genetic results were completely congruent with the phenetic groupings based on craniodental and external morphology, as each of the eight Taiwanese taxa proved to be reciprocally monophyletic. 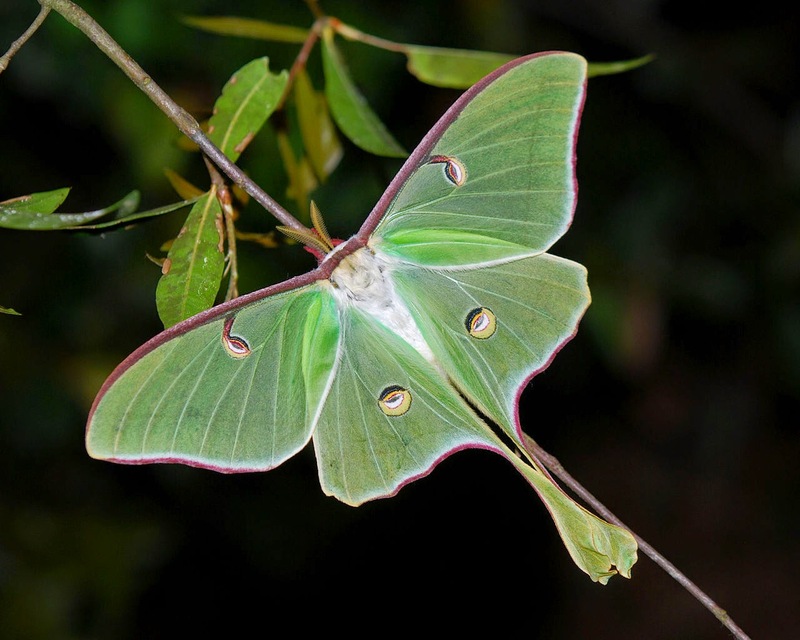 Two unnamed taxa that did not fit into any of the known species were described as species new to science. Furthermore the taxon latirostris usually associated to the Asian M. muricola, was phylogenetically and morphologically distant from any other known Myotis and was assigned here to the fossil (Miocene) genus Submyotodon. Submyotodon latirostris, M. secundus sp. n. and M. soror sp. n. are endemic species from Taiwan, whereas the other five Myotis are more widespread and also found in the mainland. An identification key is provided to ease the discrimination of these Myotinae species in Taiwan and adjacent China. photos: Ulrike Bauer, University of Bristol, U.K. 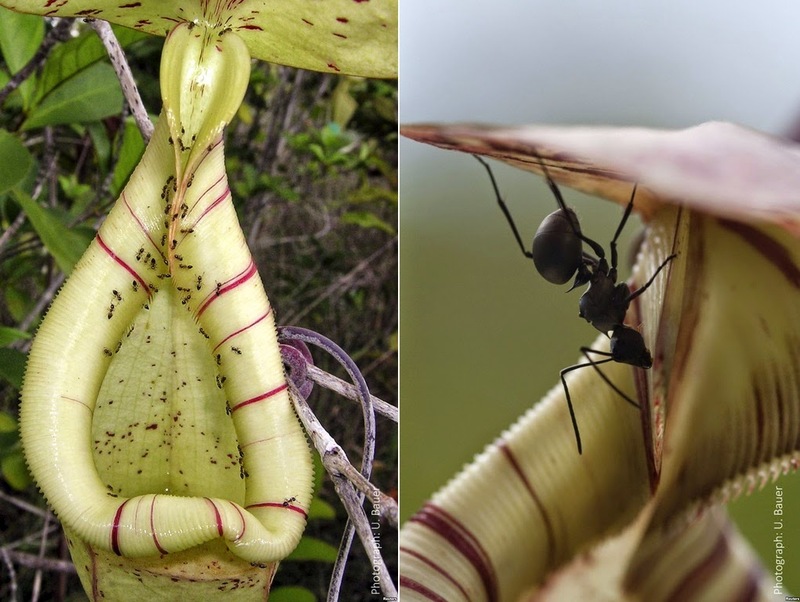 Carnivorous Nepenthes pitcher plants capture arthropods with specialized slippery surfaces. The key trapping surface, the pitcher rim (peristome), is highly slippery when wetted by rain, nectar or condensation, but not when dry. As natural selection should favour adaptations that maximize prey intake, the evolution of temporarily inactive traps seems paradoxical. Here, we show that intermittent trap deactivation promotes ‘batch captures' of ants. Prey surveys revealed that N. rafflesiana pitchers sporadically capture large numbers of ants from the same species. Continuous experimental wetting of the peristome increased the number of non-recruiting prey, but decreased the number of captured ants and shifted their trapping mode from batch to individual capture events. Ant recruitment was also lower to continuously wetted pitchers. Our experimental data fit a simple model that predicts that intermittent, wetness-based trap activation should allow safe access for ‘scout’ ants under dry conditions, thereby promoting recruitment and ultimately higher prey numbers. The peristome trapping mechanism may therefore represent an adaptation for capturing ants. The relatively rare batch capture events may particularly benefit larger plants with many pitchers. This explains why young plants of many Nepenthes species additionally employ wetness-independent, waxy trapping surfaces. FIGURE 1. Images of Gaultheria series Trichophyllae habitats, and G. albiflora, G. ciliisepala, and G. crassifolia. A–C. Gaultheria series Trichophyllae habitats: glacially carved valley along road from Gongshan to Dulongjiang, east slope of Gaoligong Shan, ca. 3400 m elev. (A), along trail from Qi Qi Forestry Station to Dong Shao Fang and the pass, east slope of Gaoligong Shan, ca. 3600 m elev. (B), just below Sila Pass, east slope of Biluo Xue Shan, ca. 4000 m elev. (C). D–F. Gaultheria albiflora, habit (D), fruit, lateral view (E) and apical view (F) (L. Lu LL-2013-50). G–K. Gaultheria ciliisepala, habit (G), flowers showing variation in size and color (H–I), fruit, lateral view (J) and apical view (K) (G: L. Lu & P.W. Fritsch LL-2011-8; H: L. Lu 06-15; I: L. Lu LL-2014-4; J–K: L. Lu LL-2013-20). L–P. Gaultheria crassifolia, habit (L), flower, lateral view (M) and apical view (N), fruit, lateral view (O) and apical view (P) (L, P: L. Lu LL-2013-13; M–N, LL-2014-30; O: L. Lu LL-2013-33). Photographs: A, C, E–F, I–L by PWF; B, D, G–H, M–P by LL. Scale bars: D, L, 5 cm; E–F, H–I, M–P, 5 mm; G, 10 cm; J–K, 10 mm. 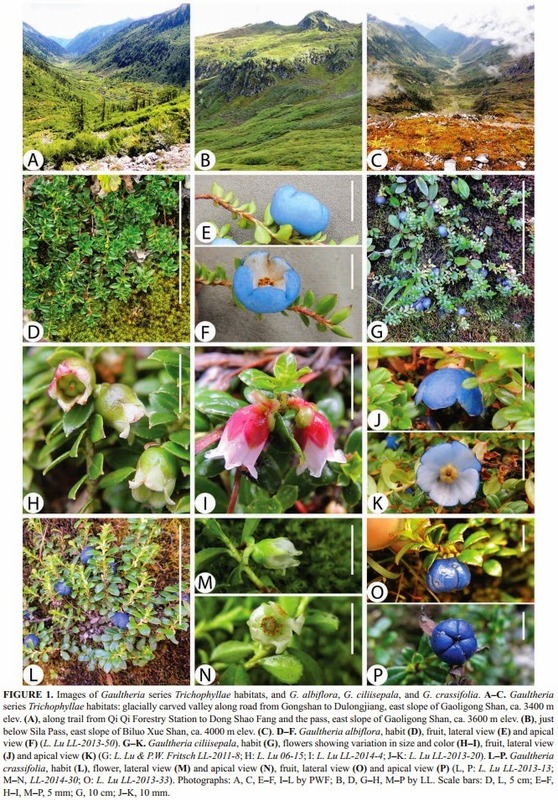 Expeditions to the Gaoligong Mountains and Biluo Snow Mountains in western Yunnan Province, China have uncovered new taxonomic information about the species of Gaultheria series Trichophyllae (Ericaceae) that are known to occur in these ranges. Based on these data, we describe two species as new to science (G. ciliisepala and G. stenophylla) and elevate four varieties (Chiogenes suborbicularis var. albiflorus, G. sinensis vars. crassifolia and major, and G. trichophylla var. obovata) to the species level (as G. albiflora, G. crassifolia, G. major, and G. obovata, respectively). We provide a lectotype and a revised description for G. eciliata because the type was discovered to also include individuals of G. albiflora. Similarly, we provide a lectotype and a revised description for G. sinensis because the type was discovered to also include an individual of G. crassifolia; moreover, the protologue of G. sinensis includes paratypes of three other species. Illustrations and photographic images of living plants in the field are included for all species. Our additions and changes raise the number of species recognized in G. series Trichophyllae from 10 to 16, with more to be expected as the Himalaya-Hengduan Mountains are further surveyed for these plants. Peter W Fritsch, Lu Lu, Hong Wang and De-zhu Li. 2015. 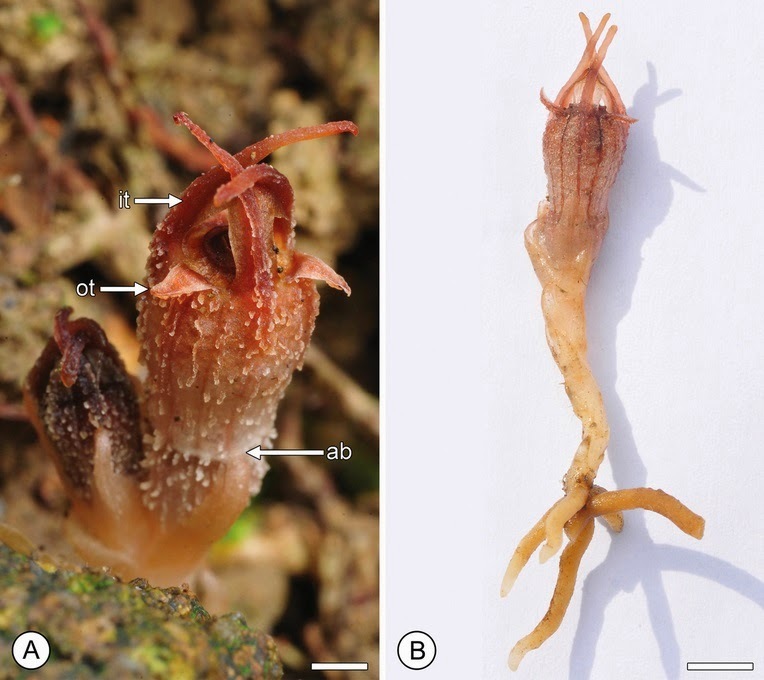 New Species, Taxonomic Renovations, and Typifications in Gaultheria series Trichophyllae (Ericaceae). The massive wetlands once covered the Amazon River basin about 13 million years ago during the late middle Miocene. 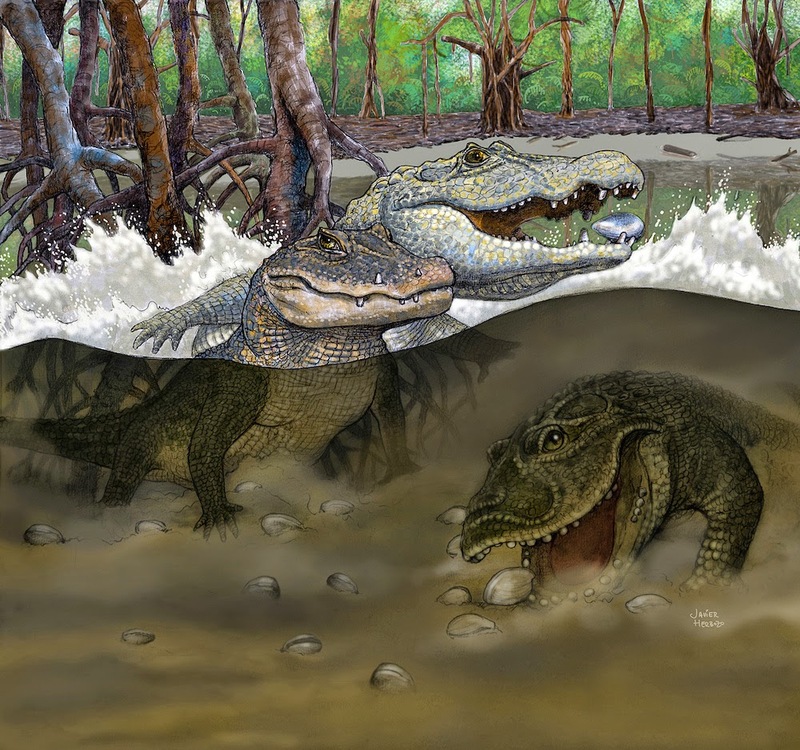 Three newly discovered species of crocodylians, including Kuttanacaiman iquitosensis (left), Caiman wannlangstoni (right) and Gnatusuchus pebasensis (bottom), look for clams, which they could likely scoop up with their mouths and crunch with their peglike teeth. Amazonia contains one of the world's richest biotas, but origins of this diversity remain obscure. Onset of the Amazon River drainage at approximately 10.5 Ma represented a major shift in Neotropical ecosystems, and proto-Amazonian biotas just prior to this pivotal episode are integral to understanding origins of Amazonian biodiversity, yet vertebrate fossil evidence is extraordinarily rare. Two new species-rich bonebeds from late Middle Miocene proto-Amazonian deposits of northeastern Peru document the same hyperdiverse assemblage of seven co-occurring crocodylian species. Besides the large-bodied Purussaurus and Mourasuchus, all other crocodylians are new taxa, including a stem caiman — Gnatusuchus pebasensis — bearing a massive shovel-shaped mandible, procumbent anterior and globular posterior teeth, and a mammal-like diastema. 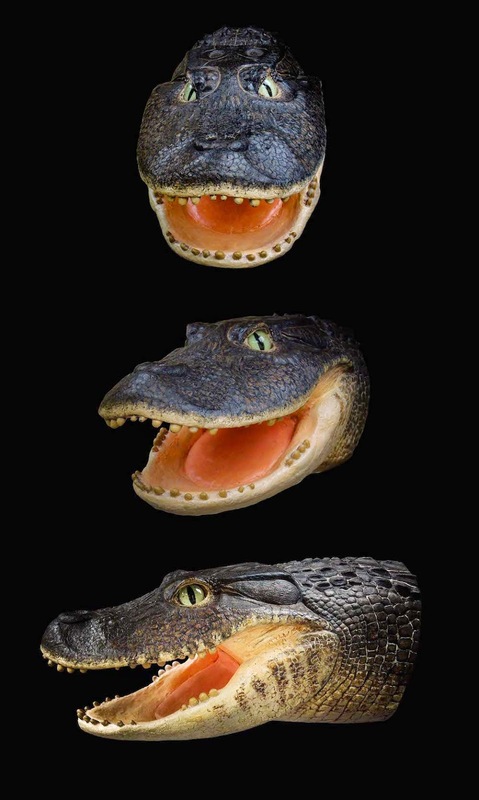 This unusual species is an extreme exemplar of a radiation of small caimans with crushing dentitions recording peculiar feeding strategies correlated with a peak in proto-Amazonian molluscan diversity and abundance. These faunas evolved within dysoxic marshes and swamps of the long-lived Pebas Mega-Wetland System and declined with inception of the transcontinental Amazon drainage, favouring diversification of longirostrine crocodylians and more modern generalist-feeding caimans. 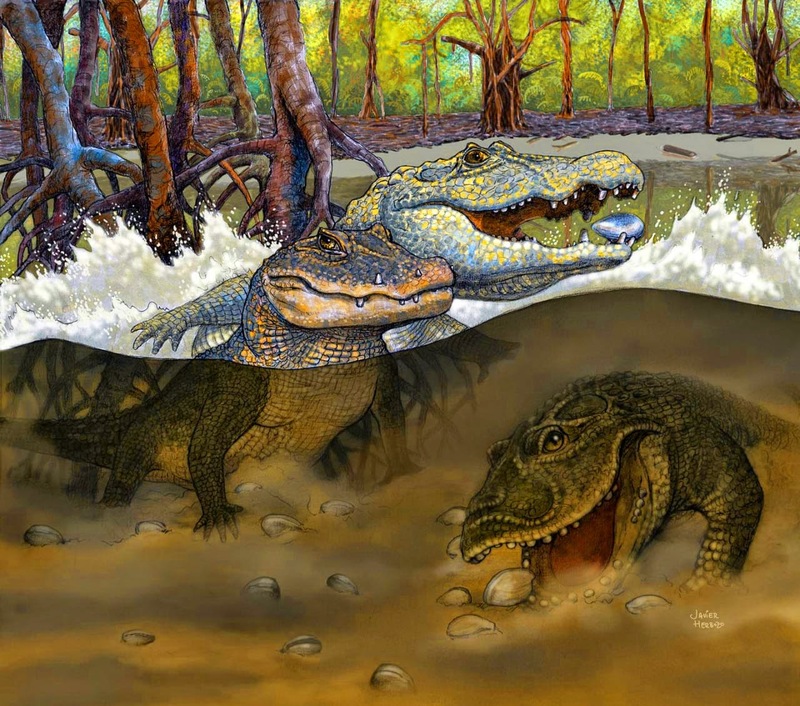 The rise and demise of distinctive, highly productive aquatic ecosystems substantially influenced evolution of Amazonian biodiversity hotspots of crocodylians and other organisms throughout the Neogene. Figure 4. Phylogenetic position of the Pebasian caimanines within the Alligatoroidea. Time-calibrated, strict consensus cladogram of 70 most parsimonious trees (see electronic supplementary material, figure S6 and test S1). Gnatusuchus pebasensis is the most basal caimanine and Globidentosuchus brachyrostris is the next outgroup to all remaining caimanines; these two taxa reveal unknown character states ancestrally present within the caimans (i.e. long splenial symphysis, posterior globular teeth) and their inclusion influenced the topology of relationships within the caimanine clade. Character support provides a novel sister-grouped relationship between the South American caimans and the North American Cretaceous globidontan alligatoroids (i.e. Brachychampsa, Albertochampsa and Stangerochampsa), whereas prior analyses showed either the monophyly of Alligatoridae (Caimaninae + Alligatorinae) exclusive of Cretaceous globidontans or, more recently, a polytomy within the globidontan alligatoroids (Caimaninae + [alligatorines and Cretaceous globidontans]). Here, this polytomy (dotted lines) is obtained when the alligatorine Allognathosuchus wartheni is excluded from the analysis. Results also suggest an early diversification of major groups within the Caimaninae dating back to the end of the Cretaceous or Palaeocene interval. (a) The Acre Phase (ca 9 Ma) after intense Andean uplift and onset of the transcontinental Amazon River System. (b) The Pebas Mega-Wetland System in northwestern South America during MZ8 (ca 13 Ma). Stratigraphic distribution of taxa (yellow bars for crushing-dentition caimanines, black lines for other taxa) relative to major Neogene stages and events in Amazonia. Palaeogeographical reconstructions, Andean uplift peaks (black triangles) and marine incursions (m) are from Hoorn et al. Molluscan Zones and diversity for the Pebas System (MZ1–12) are from Wesselingh et al. When suitable, internal nodes were time-calibrated with molecular data from Oaks. Darker grey marks MZ8. Alligatoroids are from South America, Asia (AS), Central America (CA), Europe (EU) or North America (NA). Excavated fossils from Peru show that seven species of crocodylian lived together in the same place at relatively the same time. The skulls and jaws, shown above, are extremely diverse, the researchers said. They include (1) Gnatusuchus pebasensis, (2) Kuttanacaiman iquitosensis, (3) Caiman wannlangstoni, (4) Purussaurus neivensis, (5) Mourasuchus atopus, (6) Pebas Paleosuchus, and (7) Pebas gavialoid. Rodolfo Salas-Gismondi, John J. Flynn, Patrice Baby, Julia V. Tejada-Lara, Frank P. Wesselingh and Pierre-Olivier Antoine. 2015. A Miocene Hyperdiverse Crocodylian Community reveals Peculiar Trophic Dynamics in proto-Amazonian Mega-Wetlands. Proceedings of the Royal Society B. Figure 3. 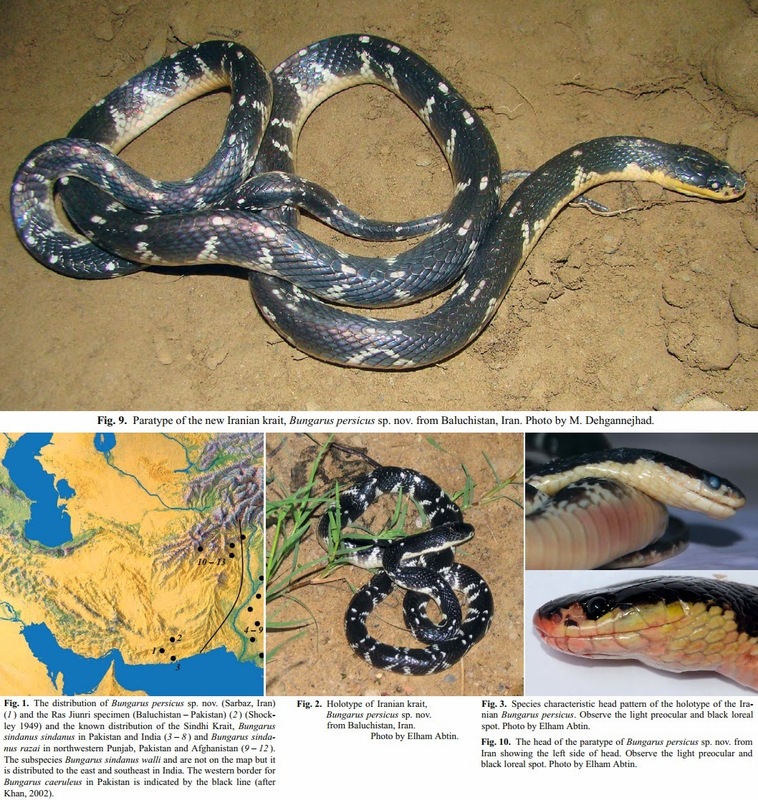 Photographs illustrating diagnostic characters of Euphlyctis species. Ventral views of (A) Euphlyctis cyanophlyctis (adult male, institutional collection’s specimen number: RGCB-5695) and (B) Euphlyctis kalasgramensis sp. nov. (adult male, institutional collection’s specimen number: MHL-B1001) (C) dorso-lateral view of Euphlyctis cyanophlyctis (adult male, institutional collection’s specimen number: RGCB-5695) and (D) dorso-lateral view of Euphlyctis kalasgramensis sp. nov. (adult male, institutional collection’s specimen number: MHL-B1001). 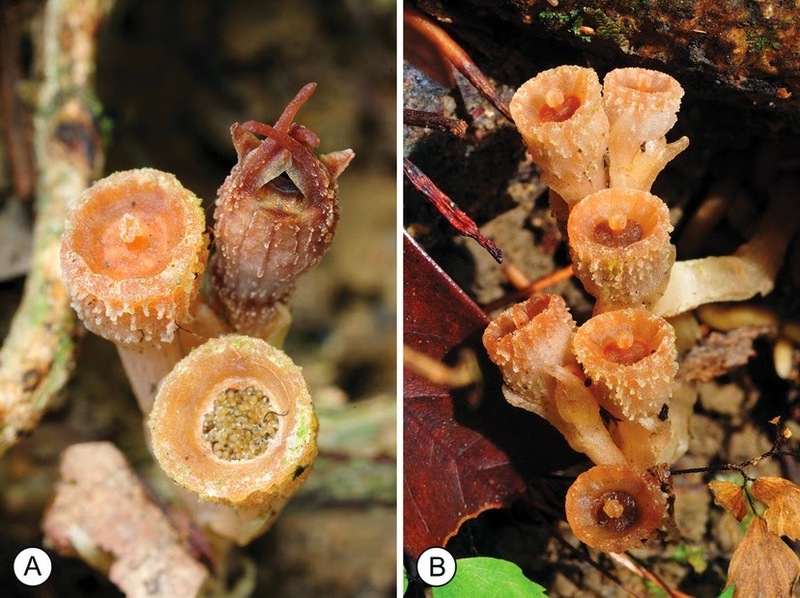 A new species of the genus Euphlyctis is described from the Barisal district of Bangladesh and compared with its morphologically similar and geographically proximate congeners. The new species is highly divergent in comparison to other congeneric species on basis of sequence divergence in mitochondrial DNA gene sequences (ranging from 5.5% to 17.8% divergence). Euphlyctis kalasgramensis sp. nov. can be readily diagnosed by having the following combination of characters: snout-vent length (SVL) 30.44 – 37.88 mm, absence of mid-dorsal line, nostril–snout length 3% of SVL, nostril much closer to snout tip than eye, nostril–snout length 48% of distance from front of eyes to nostril, relative length of fingers (shortest to longest: 1 = 2 < 4 < 3), tibia length 59% of SVL, foot length 55% of SVL. Figure 2. Photographs of Euphlyctis kalasgramensis sp. nov.
(C) Ventral view of hand, (D) ventral view of foot, and (E) posterior view of thighs. Mohammad Sajid Ali Howlader , Abhilash Nair, Sujith V. Gopalan and Juha Merilä. 2015. A New Species of Euphlyctis (Anura: Dicroglossidae) from Barisal, Bangladesh. The distribution of Bungarus persicus sp. 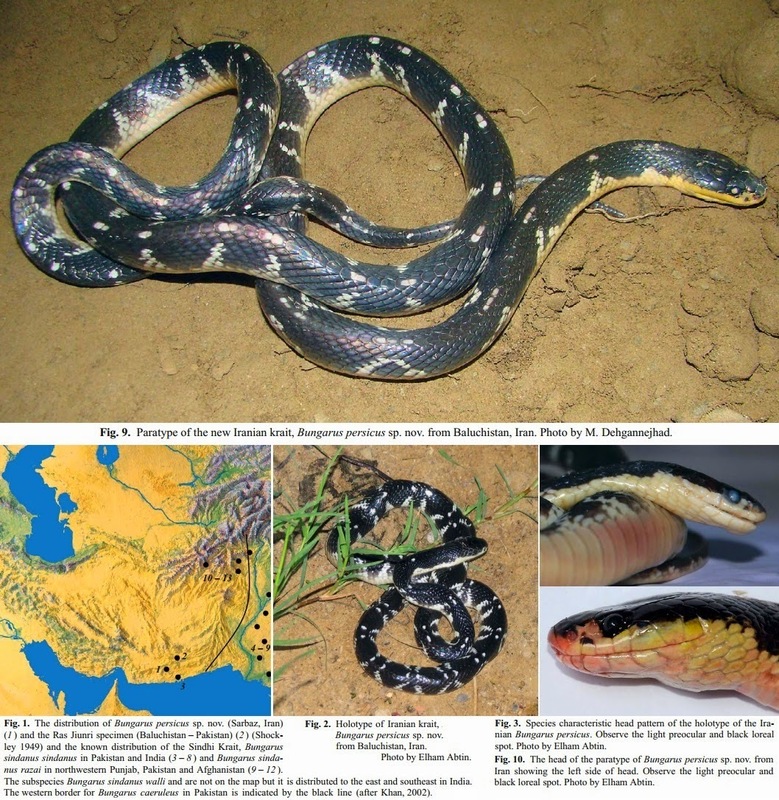 nov. (Sarbaz, Iran) (1 ) and the Ras Jiunri specimen (Baluchistan – Pakistan) (2 ) (Shockley 1949) and the known distribution of the Sindhi Krait, Bungarus sindanus sindanus in Pakistan and India (3–8 ) and Bungarus sindanus razai in northwestern Punjab, Pakistan and Afghanistan (9 – 12 ). The subspecies Bungarus sindanus walli and are not on the map but it is distributed to the east and southeast in India. The western border for Bungarus caeruleus in Pakistan is indicated by the black line (after Khan, 2002). D–F, G. hagen, new species, Cilacap, Java. Oliver Mengedoht (specimens not preserved) [D, E]). 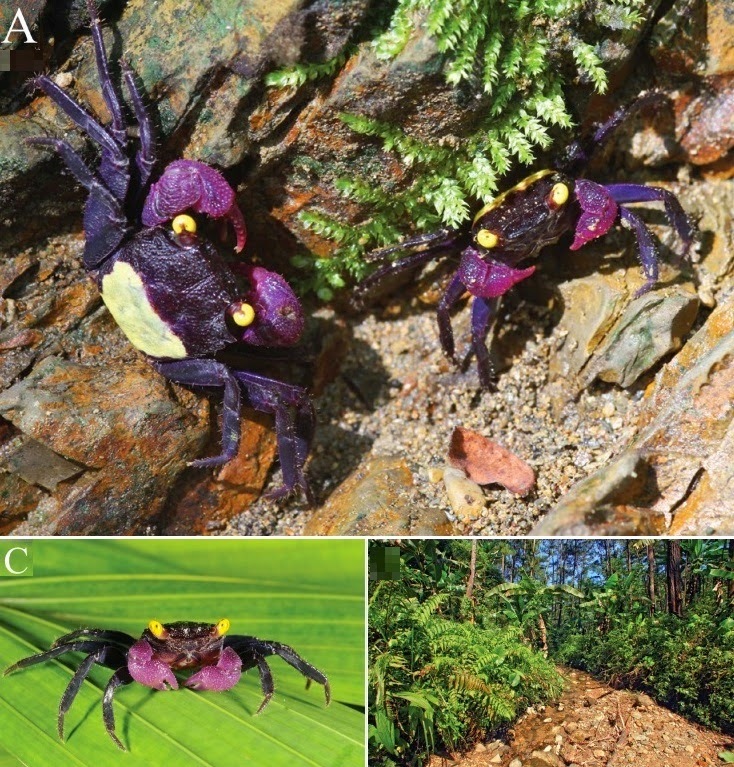 Two new species of land-dwelling sesarmid crabs of the genus Geosesarma De Man, 1892, are described from central Java, Indonesia. These species have been in the aquarium trade for many years and go by the popular name of “vampire crabs”. The two species, here named Geosesarma dennerle and G. hagen, are formally described and compared with their closest congeners in Java, G. noduliferum (De Man, 1892) and G. bicolor Ng & Davie, 1995. The identities of G. noduliferum, the type species of the genus, and G. confertum (Ortmann, 1894) are also clarified. 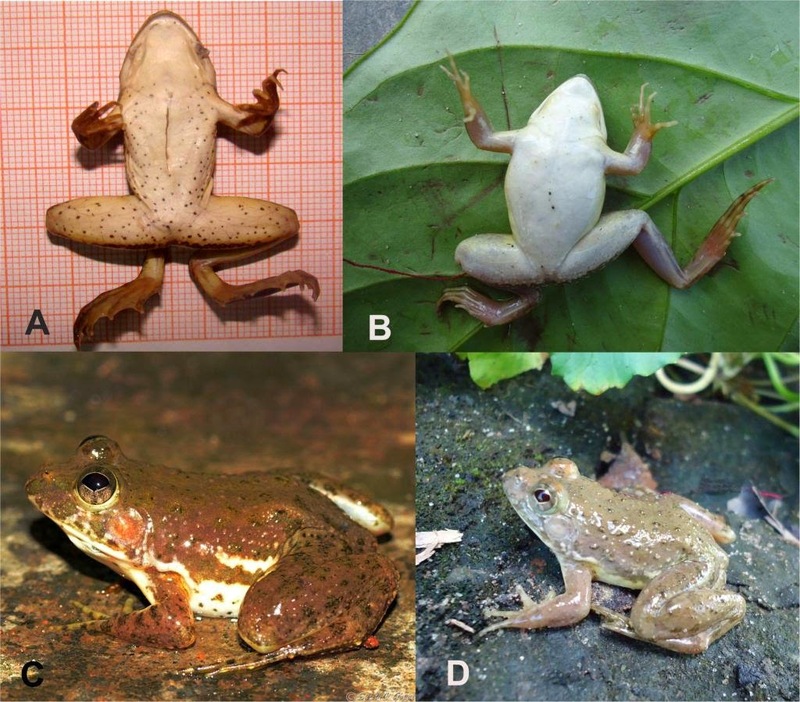 [left] specimens from aquarium trade, from Cilacap, Java; D, type locality of G. hagen, new species; E, adult on bank of stream; F, an adult male of on moss covered stream bank. Peter K. L. Ng, Christoph D. Schubart and Christian Lukhaup. 2015. 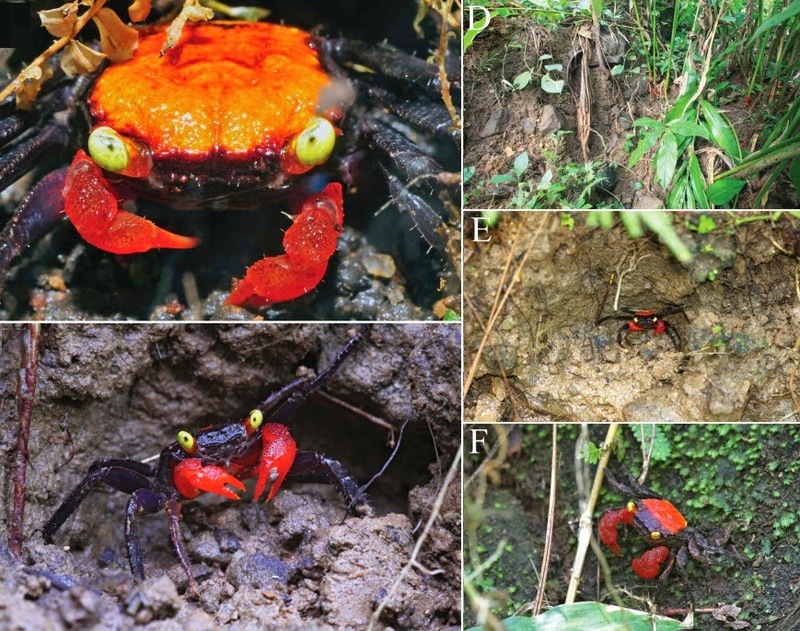 New Species of “Vampire Crabs” (Geosesarma De Man, 1892) from central Java, Indonesia, and The Identity of Sesarma (Geosesarma) nodulifera De Man, 1892 (Crustacea, Brachyura, Thoracotremata, Sesarmidae). Raffles. Bull. Zool. 63. 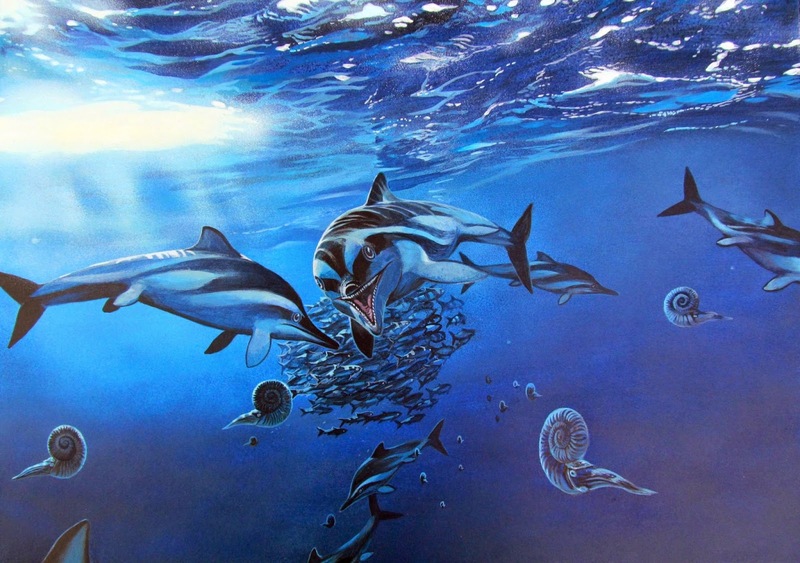 Life restoration of Ichthyosaurus anningae. 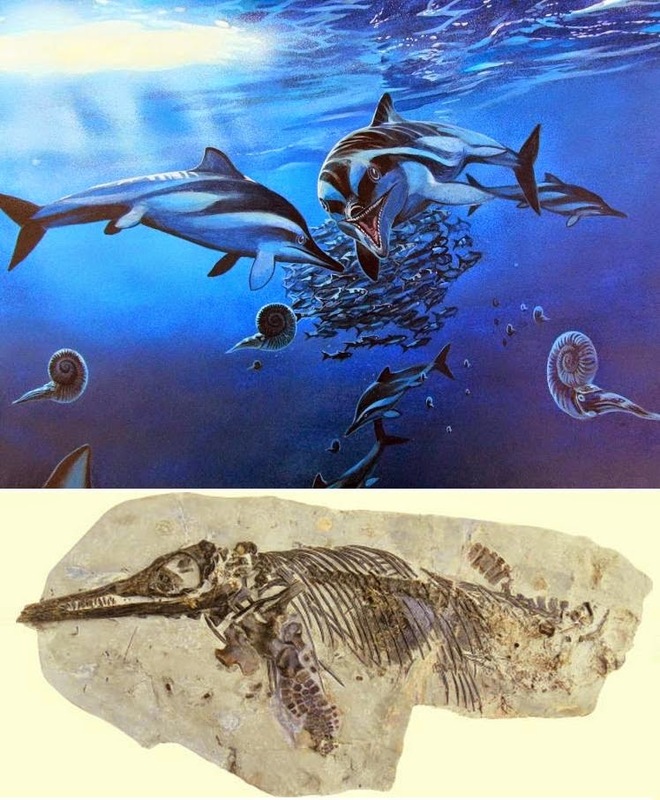 We describe a new species of Lower Jurassic (Hettangian/Sinemurian–Pliensbachian) ichthyosaur, Ichthyosaurus anningae, sp. nov., from west Dorset, England, U.K. The holotype of I. anningae (DONMG:1983.98), at least a subadult, is from the lower Pliensbachian Stonebarrow Marl Member (Charmouth Mudstone Formation). It is the most complete ichthyosaur known from this time interval worldwide. The species is assigned to Ichthyosaurus on the basis of humerus, forefin, and pectoral girdle morphologies. Diagnostic features of the species include a short, robust humerus with prominent processes; a femur in which the proximal width is almost as large as the distal width; and a very small femur relative to the humerus (humerus/femur ratio >1.7). Four other specimens, at least three of which are juveniles, are referred to this species. 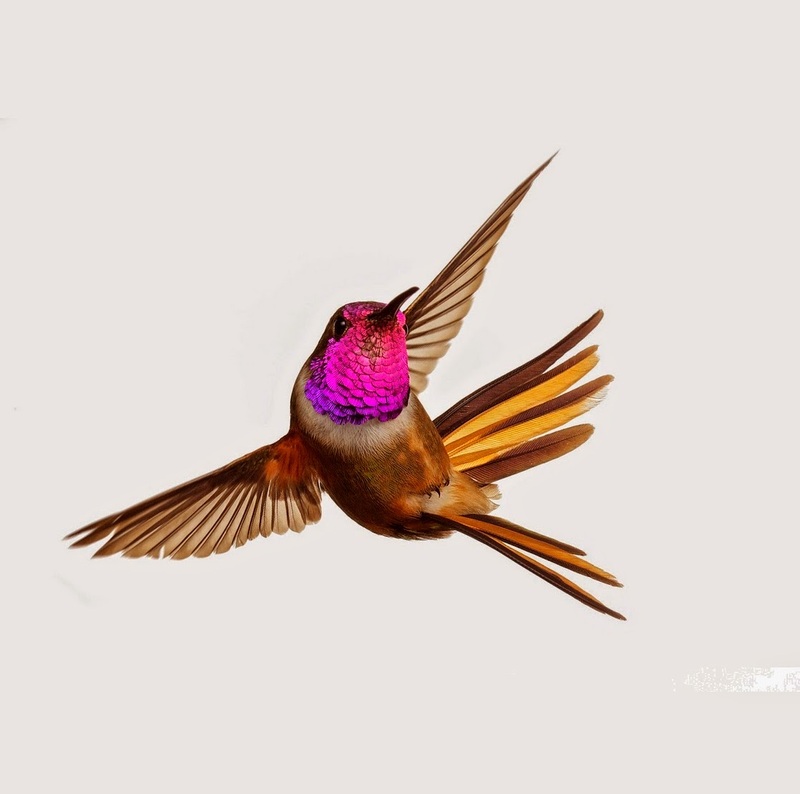 The new species may display sexual dimorphism in humeral morphology, but this cannot be confirmed due to a lack of stratigraphic information. With the recognition of I. anningae, at least three and possibly as many as five ichthyosaur species, representing three genera, are known from the Pliensbachian. 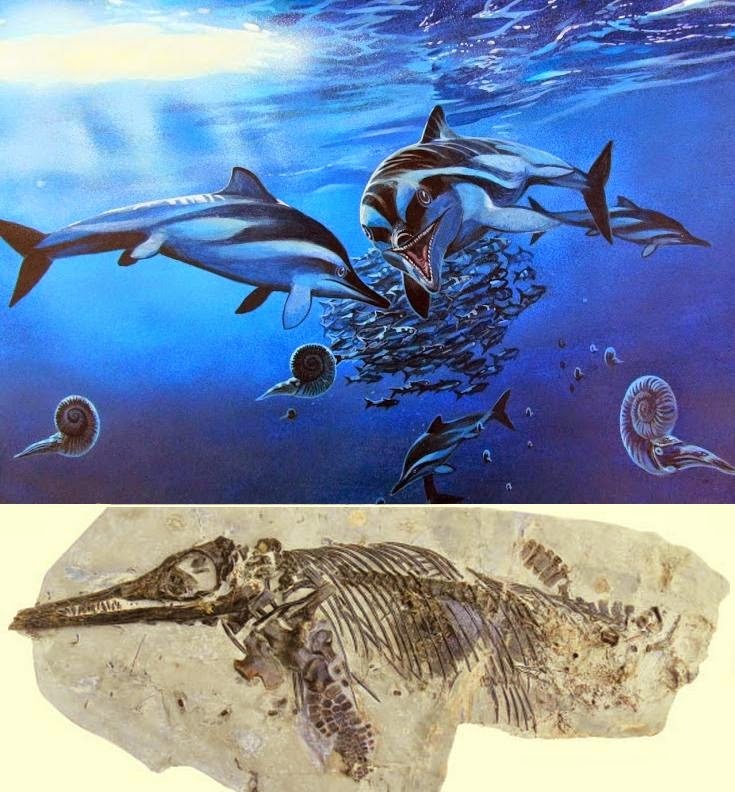 A new species of ichthyosaur, an extinct marine reptile which was alive at the same time as the dinosaurs, has been identified from a fossil found on Dorset’s Jurassic coast. lower: Different sizes of pellets and prey’s skulls of eastern grass owl. The eastern grass owl Tyto longimembris (นกแสกทุ่งหญ้า) was first detected in Thailand in July 2006 at Nong Lom, a grassland in open peat swamp located in the south part of Nong Bong Khai Non-hunting Area, Chiang Rai. Here, it is considered to be a rare resident. At this site, we studied the diet of eastern grass owl by analysing regurgitated pellets collected at their nests during the breeding season from December 2010 to February 2011. We collected 67 pellets from five nests and identified 33 mammal skulls. To identify prey species, DNA was extracted from skulls and was analysed based on molecular techniques. The dietary remains consisted of three murids (Muridae), with the house rat Rattus rattus the dominant species detected (16 skulls, 48.5 % occurrence), and the remainder being Asian house mouse Mus musculus (13 skulls, 39.4%) and ricefield mouse Mus caroli (4 skulls, 12.1%). Akalak Kunsorn, Siriwadee Chomdej, Narit Sitasuwan, Prasit Wangpakapattawong,Chatmongkon Suwannapoom and Brett K. Sandercock. 2015. First Investigation on the Diet of the Eastern Grass Owl During the Nesting Period in Thailand. Raffles. Bull. Zool. 63: 27–32. Kasorndorkbua, C., Kunsorn, A. & Wongchai, C. 2008. Nesting records of eastern grass owl Tyto (capensis) longimembris in Chiang Rai, northern Thailand. 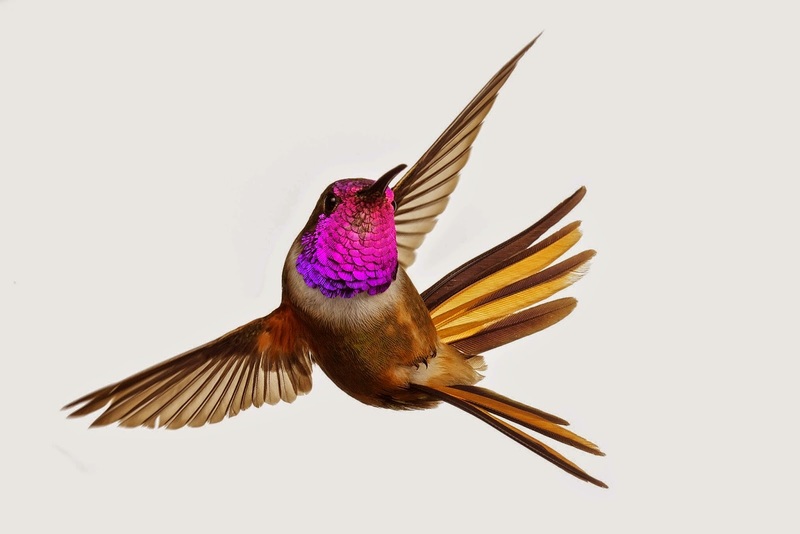 BirdingASIA. 9: 91–93. 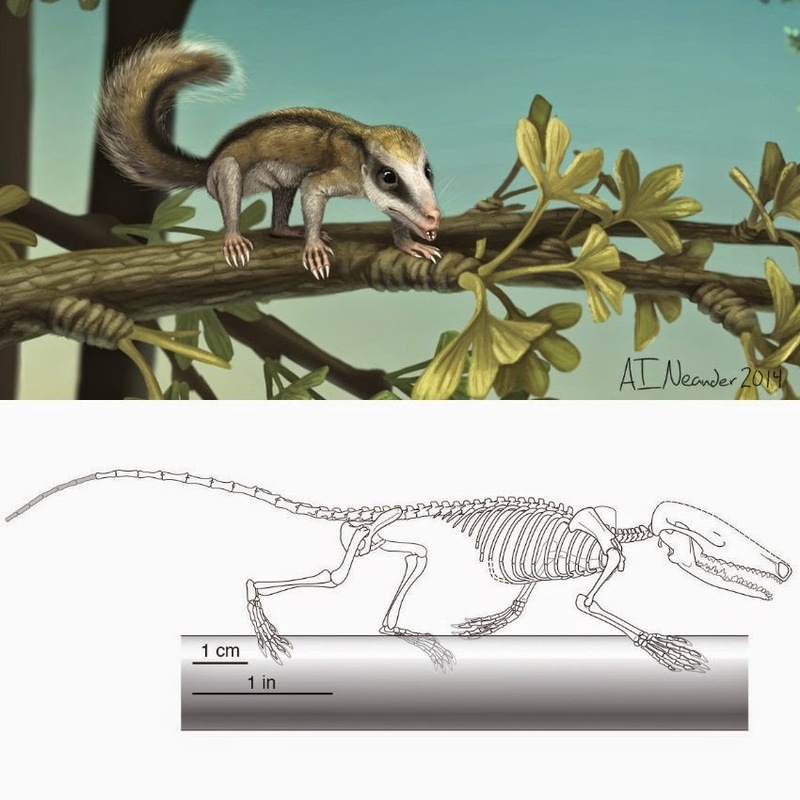 Early mammals had a surprisingly wide range of adaptations, ranging from the tree-climbing Agilodocodon (top) to the swimming Castorocauda (in the water) and the burrowing Docofossor (bottom). 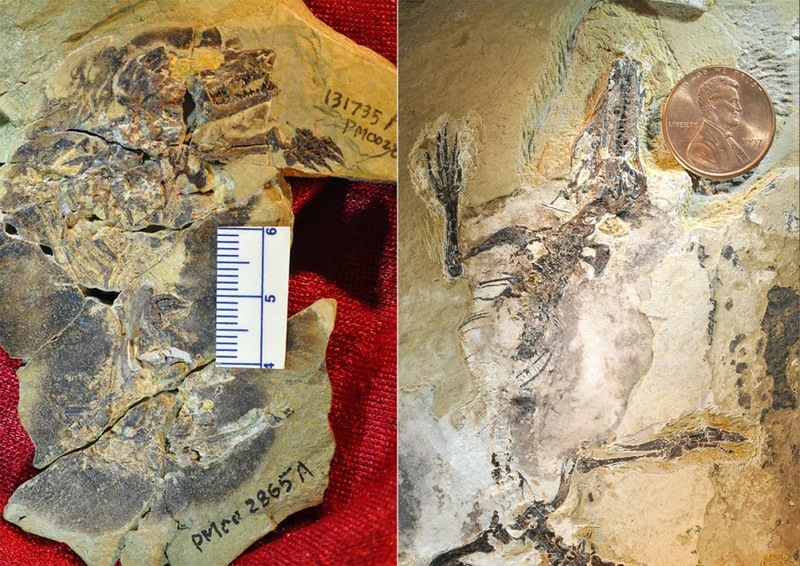 fossils of Docofossor (left) and Agilodocodon (right), the earliest-known subterranean and arboreal mammals. 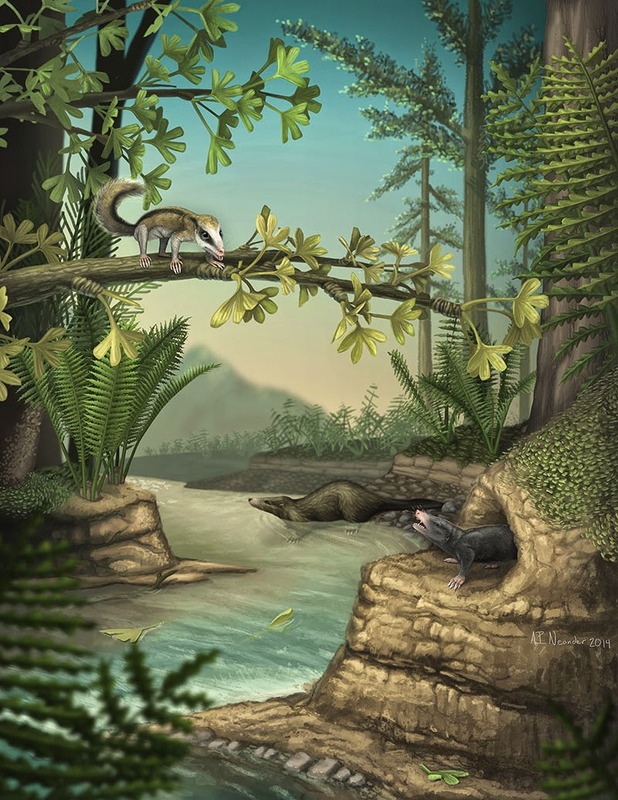 What were the lives of the earliest mammals like? For many, what comes to mind is an image of a small, insect-eating creature that scurried about at night, hiding from dinosaurs and eking out a meager existence. After all, intense competition from the terrible lizards must surely have forced our very distant ancestors into very limited ecological niches. While there’s some truth to this stereotype, more and more evidence suggests that early mammals were actually remarkably diverse. 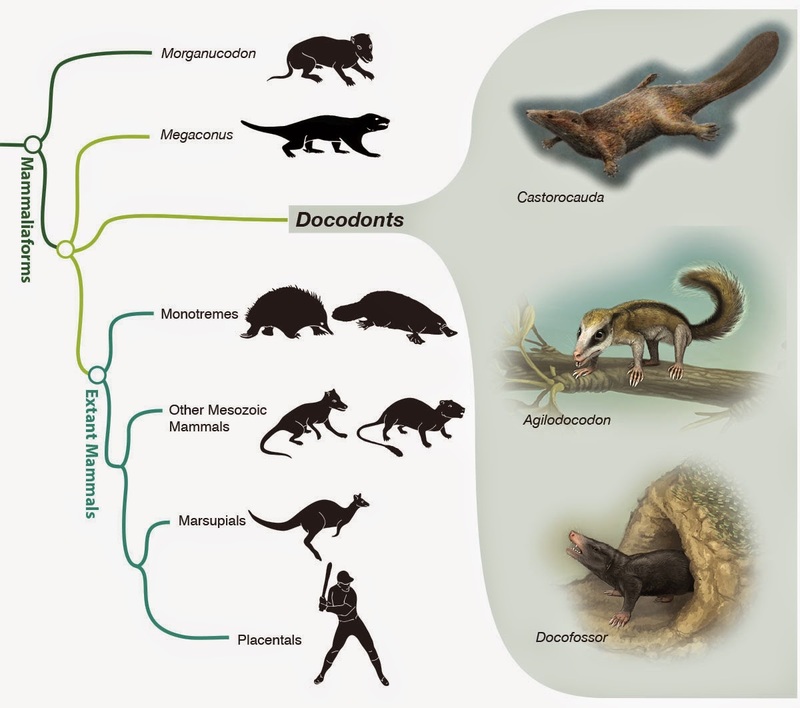 The fossils of two interrelated ancestral mammals, newly discovered in China, now help confirm that the wide-ranging ecological diversity of modern mammals had a precedent more than 160 million years ago. Stem mammaliaforms (also known as “stem mammals”) are long-extinct relatives to the extant mammals (crown Mammalia). Docodonts are such a lineage of stem mammaliaforms. Their morphologies provide evidence for the ancestral mammalian condition. A new docodontan mammaliaform from the Middle Jurassic of China has skeletal features for climbing and dental characters indicative of an omnivorous diet that included plant sap. 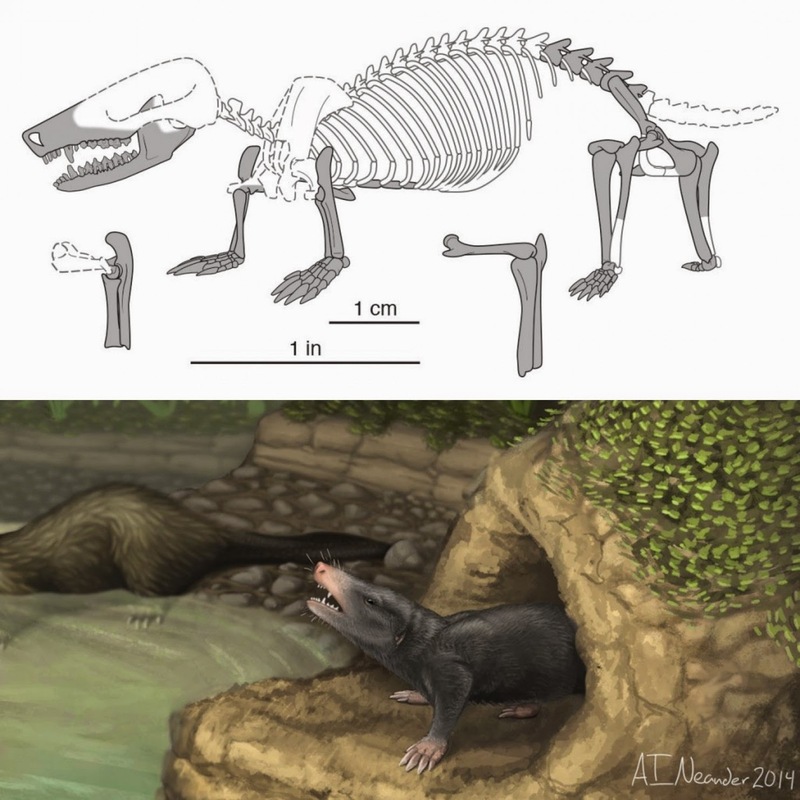 This fossil expands the range of known locomotor adaptations in docodontans to include climbing, in addition to digging and swimming. It further shows that some docodontans had a diet with a substantial herbivorous component, distinctive from the faunivorous diets previously reported in other members of this clade. This reveals a greater ecological diversity in an early mammaliaform clade at a more fundamental taxonomic level not only between major clades as previously thought. 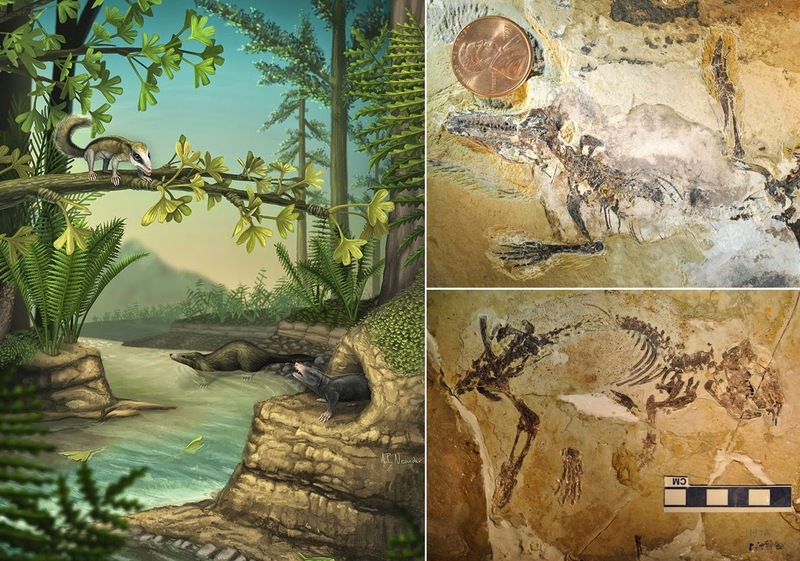 A new Late Jurassic docodontan shows specializations for a subterranean lifestyle. It is similar to extant subterranean golden moles in having reduced digit segments as compared to the ancestral phalangeal pattern of mammaliaforms and extant mammals. The reduction of digit segments can occur in mammals by fusion of the proximal and intermediate phalangeal precursors, a developmental process for which a gene and signaling network have been characterized in mouse and human. Docodontans show a positional shift of thoracolumbar ribs, a developmental variation that is controlled by Hox9 and Myf5 genes in extant mammals. 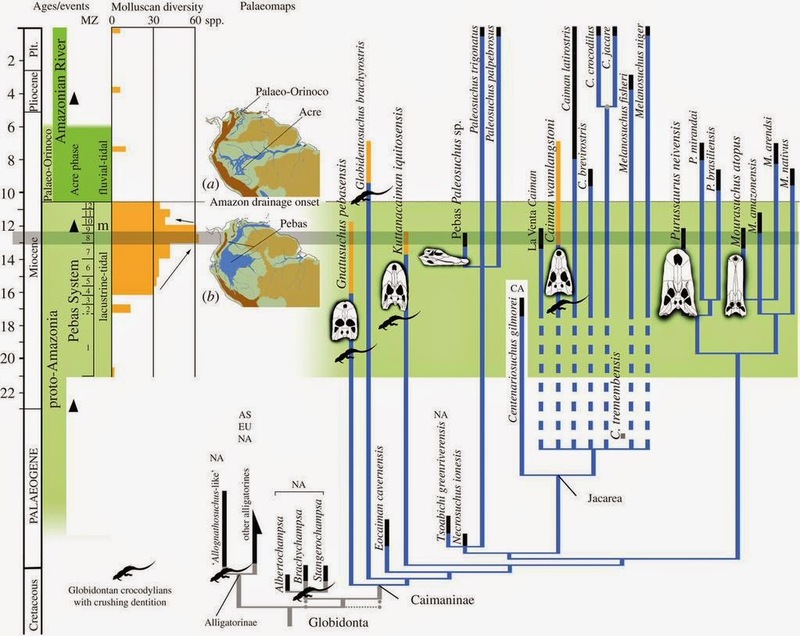 We argue that these morphogenetic mechanisms of modern mammals were operating before the rise of modern mammals, driving the morphological disparity in the earliest mammaliaform diversification. and B, D: A. foliosquama (WAM R150365) from Barrow Island. The critically endangered leaf-scaled (Aipysurus foliosquama) and short-nosed (A. apraefrontalis) sea snakes are currently recognised only from Ashmore and Hibernia reefs ~600km off the northwest Australian coast. Steep population declines in both species were documented over 15 years and neither has been sighted on dedicated surveys of Ashmore and Hibernia since 2001. We examine specimens of these species that were collected from coastal northwest Australian habitats up until 2010 (A. foliosquama) and 2012 (A. apraefrontalis) and were either overlooked or treated as vagrants in conservation assessments. Morphological variation and mitochondrial sequence data confirm the assignment of these coastal specimens to A. foliosquama (Barrow Island, and offshore from Port Hedland) and A. apraefrontalis (Exmouth Gulf, and offshore from Roebourne and Broome). Collection dates, and molecular and morphological variation between coastal and offshore specimens, suggest that the coastal specimens are not vagrants as previously suspected, but instead represent separate breeding populations. 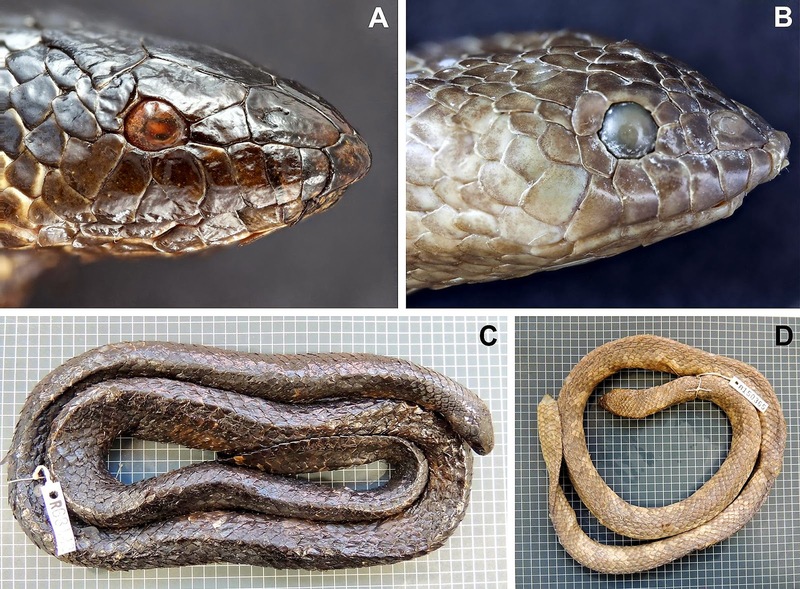 The newly recognised populations present another chance for leaf-scaled and short-nosed sea snakes, but coastal habitats in northwest Australia are widely threatened by infrastructure developments and sea snakes are presently omitted from environmental impact assessments for industry. Further studies are urgently needed to assess these species’ remaining distributions, population structure, and extent of occurrence in protected areas. Flower structure in Thismia hongkongensis sp. nov. A Mature flower, showing outer tepals (ot), inner tepals (it) and abscission zone (ab) at the base of the perianth tube. B Entire plant (S.S. Mar 1, HK). Figure 1. 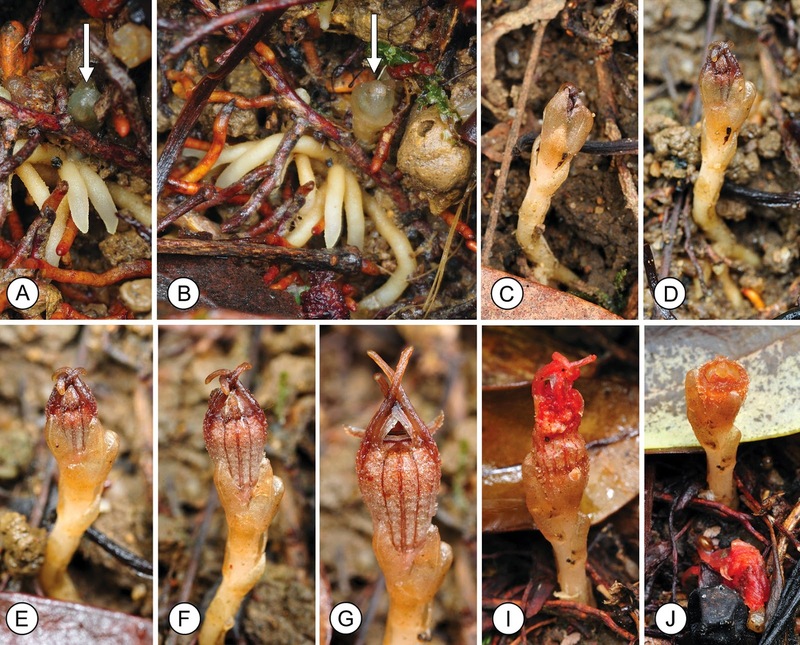 Flower development in Thismia hongkongensis sp. nov.
A, B Root system, with young flowering stalk developing (arrowed). C–G Developing flower, photographed over a 17-day period (10th, 14th, 16th, 19th and 23rd May, respectively) (S.S. Mar 1, HK). I, J Post-fertilization flower, showing abscission of perianth tube. 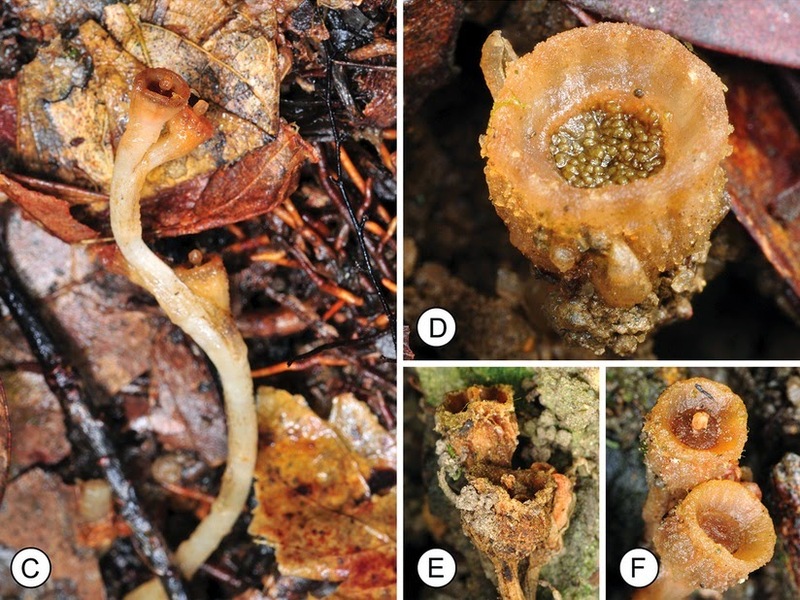 A new species, Thismia hongkongensis S.S.Mar & R.M.K.Saunders, is described from Hong Kong. 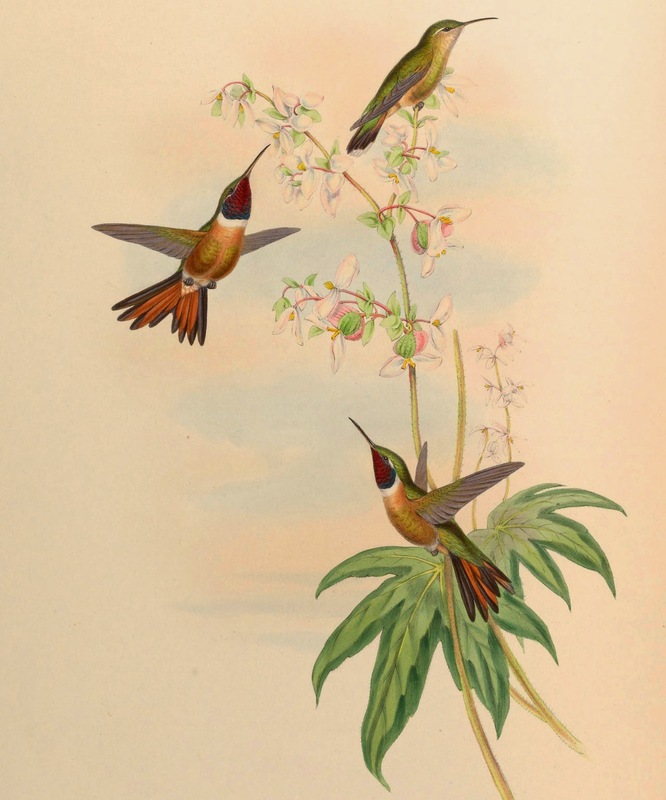 It is most closely related to Thismia brunonis Griff. from Myanmar, but differs in the number of flowers per inflorescence, the colour of the perianth tube, the length of the filaments, and the shape of the stigma lobes. 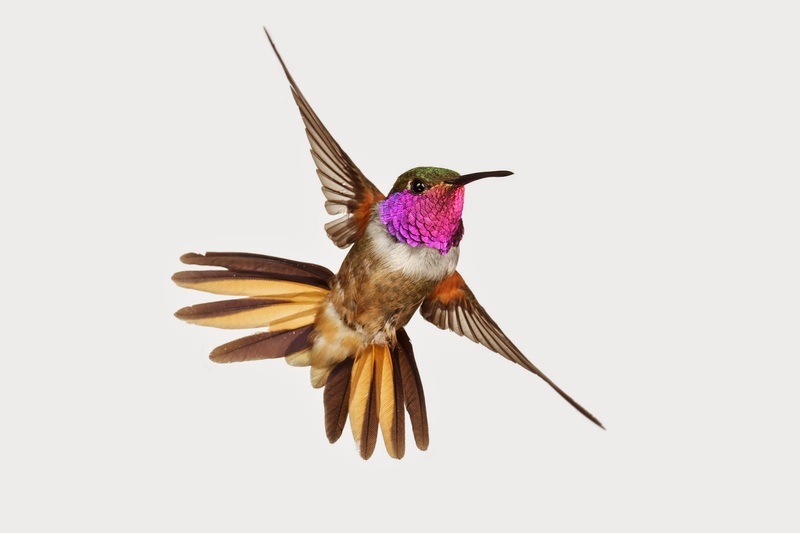 We also provide inferences on the pollination ecology and seed dispersal of the new species, based on field observations and interpretations of morphology. The flowers are visited by fungus gnats (Myctophilidae or Sciaridae) and scuttle flies (Phoridae), which are likely to enter the perianth tube via the annulus below the filiform tepal appendages, and exit via small apertures between the filaments of the pendent stamens. The flowers are inferred to be protandrous, and flies visiting late-anthetic (pistillate-phase) flowers are possibly trapped within the flower, increasing chances of pollen deposition on the receptive stigma. The seeds are likely to be dispersed by rain splash. Figure 3. Fruit structure in Thismia hongkongensis sp. nov.
A Flower (rear right), immature fruit, shortly after fertilization (left), and mature fruit with exposed seeds (front). B Two fruiting individuals, each with three fruits. C Lateral view of fruiting specimen, illustrating elongated fruit stalk. D Mature fruit with exposed seeds. E Dehydrated fruit. F Rehydrated fruit, after rainfall.